Best HR Management (HRMS) Software Development Solution Providers Company. Being the topmost IT Development Company in India, Agile Infoways is doing a great job on the grounds of IT Fraternity. We are specialized in building the most effectual and well-organized HR Software for the need of any organization. Our developers are super skilled to provide the Customized HR Software. HR Software development is the most trending need in today’s corporate world. The software provides huge flexibility to manage the whole organization and keep their data in a systematic and accessible manner. Our developers are highly skilled and proficient in managing the whole HR Software Development need of client as per their requirement. In this module, employee management will be done in a systematic manner. All the documents will get managed in this module like offer letter, acceptance letter, and all types of confidential and important documents. Employee information is maintained properly like employee bank information, tax details, employee contacts and various documents. Also, qualification of an employee is managed in this module which covers education details, salary increments, and promotion details of an employee. View the list of employees present in the company along with the company documents list and work allocations. Employees can manage different custom field as per the need of the company from the settings module. In this section, all the personal information of the employee will be maintained like bank, tax and contacts, documents. Employees’ qualification information is maintained in this section which covers their education details, promotion and salary information. The employee will be added and managed with their documents, offer letter and acceptance letter. In this module, the whole management of contractors will be done. Contractors are people who work for the organization on a contract basis. Contractors will be added to this module that will join the organization. Also, the whole list of contractors will be seen in this module who is working and also who left the organization. Payment history can also be viewed but this section is not mandatory and can be added when the client required. The list of contractors can be viewed from this section and you can get all the details of the contractors in detail. In this section, the contractor will be added to the list and his record will be maintained till he is in the organization. The history of payment will be managed in this section of the contractors. This field is not mandatory and can be added on demand. Admin has full right to access all the modules i.e. employee and contractor module. 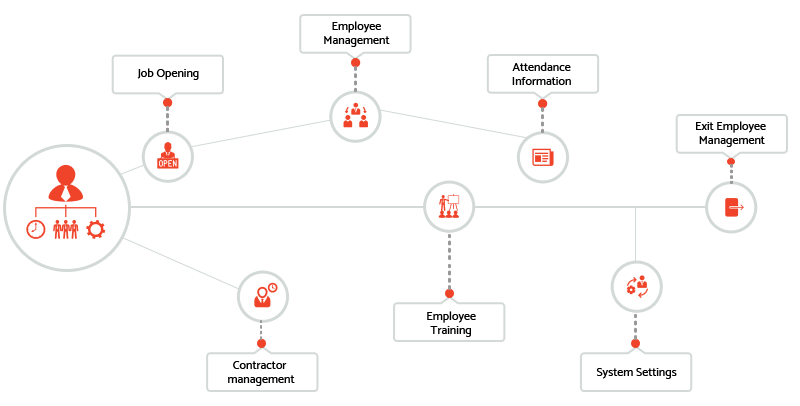 Admin can manage graphical charts that will show the different information of employees like attendance, holidays, leaves, and employee length. Employee attendance and employees’ training tracking is managed under the admin section. Admin can manage the whole structure of the organization which includes HR information, Tax information, Company information and more such. Admin will subscribe and configure email notifications on the update of task management module. Admin will manage organizational structure that includes information about the company, tax, HR contact and location. If an employee is under the training period then their tracking will be done in this module and will be managed by the admin. In this section, admin will manage the working hour list of every single employee along with their leaves and holiday. Admin will keep all the information of employees like time and attendance as per their work and presence in the organization. In this section, the admin will display the graphical representation of employees’ data for vacation, holidays, and leaves, attendance calendar, citizenship and more. Admin will configure and subscribe email notifications to receive system updates for task management. The organization can boost their business revenue by running the whole management in a systematic manner. The record of every single thing will be kept in the HR software that will help the organization to understand the flaws and improve them immediately to boost the productivity of the company. How will the staff members get login details? Admin will provide the login details to each employee and will define their tasks and jobs by giving the username and passwords. How will the employee shift be managed? Admin will manage the shift of employees as well as keep a record of employees’ work and timing. What are the unique features of HR Software? The HR Software has a unique feature known as alert and notification system used for managing events and through which admin can manage the whole process for each event which is happening in the organization. Will this software work for my industry? Yes, the HR Software can be defined sector wise and as per organization need.